This image has stayed with me. An almost Iconic image I think. 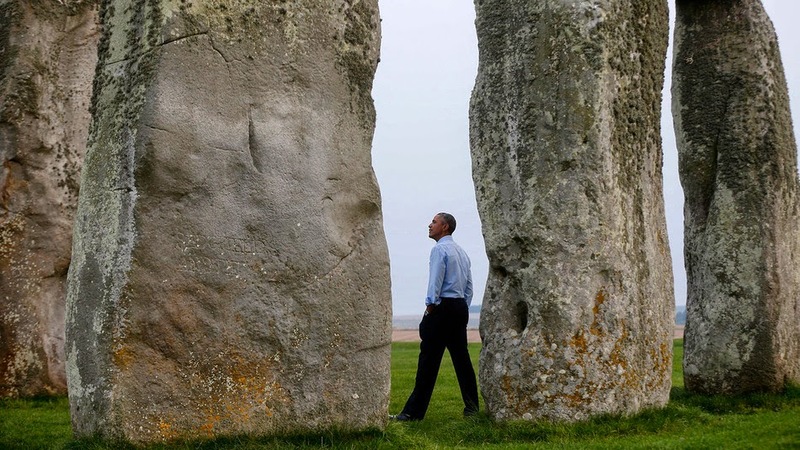 Barrack Obama's spontaneous visit to Stonehenge on Friday after being at the Nato talks in Wales. It's a powerful image. A powerful man in a powerful place. I hope he felt drawn here because these Stones needed to impart their wisdom to him. I do believe these stones hold the consciousness and energy of ancient wisdom. Call me cuckoo if you like. He needed to be here. It's important. He carries a powerful weight on his shoulders. It makes me think of times I have felt drawn to visiting ancient sites like these. Avebury, Glastonbury Tor, The Ring of Brodgar in Orkney, are the ones I can think of. These places stay with you, continue to work with you. I can think of monumentous life events that have followed visits like these. I believe they are strengthening places for the times ahead. Of course Stonehenge is like no other. He was able to wonder amongst the stones, touch them, feel them, be in awe of them. I wonder if the magnitude and presence of being with them helped him some how. I think so. You can see him here. Didn't the Raffle family have a great day out! Moved by the immovable..... Perhaps he felt some solidarity with these stones. Hope it really worked for Obama!!! I feel the same as you and have visited all those circles you mentioned. Very spiritual and magical places. As you say a very powerful and moving picture, hope it has left an impression for him and worked some of its magic. Great post, I heard he'd visited but I hadn't seen any shots - thanks for the link. In my 20s I was obsessed by ancient sites, less so now. Maybe I should reignite the passion! I've never visited any of these sites but would love to. The more nature-centric belief systems definitely appeal to me. Not that I'm a fully-fledged Pagan or Wiccan, but there is something powerful about feeling close to the earth and the seasons. Hope Obama got something from his visit! This is a great image - I'm pleased you shared it. I hope it helps him keep things in perspective.Can everyone walk around between the stones like this or do the rest of us have to view from afar? I think we have to view from afar....unless it's the Summer solstice event!